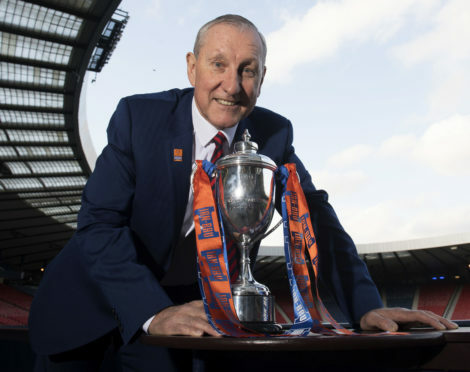 21/11/18 HAMPDEN PARK - GLASGOW Terry Butcher at Hampden Park for the Irn Bru Cup Semi-Final Draw. Former Caley Thistle manager Terry Butcher feels the emergence of Ryan Christie and Graeme Shinnie into Scotland’s national team shows why Inverness must continue to put their faith in young players. Celtic midfielder Christie and Aberdeen skipper Shinnie, who both started their careers with Inverness, impressed for the Scots in Tuesday’s 3-2 victory over Israel at Hampden Park which secured Uefa Nations League promotion for Alex McLeish’s men. Caley Jags manager John Robertson has previously indicated his high hopes for the club’s ‘class of 2018’ – a group of 10 teenagers who signed professional deals in the summer of which Daniel MacKay, Cameron Harper, Jack Brown and Roddy MacGregor have already made their debuts. Butcher, who was in charge of Inverness between 2009 and 2013 before leaving for Hibernian, feels the the success enjoyed by Christie and Shinnie should act as inspiration to some of the players in John Robertson’s squad at present. Butcher said: “We always had that incentive at Caley Thistle, where guys played with us then moved on to bigger and better things. “You want young players coming through the system. It was great to see Ryan Christie play so well in the first half for Scotland on Tuesday, and Graeme Shinnie coming on at the end. “That always gives me a real thrill because we saw these boys coming through at the start of their careers in the under-18s and they have done ever so well to get to where they are now. “Getting players in from outside the area has always been difficult, but if you give them first team football they can move on to other clubs after that if they do well. “Aberdeen were pleased as well – they took most of them along the A96. With Inverness and Highland rivals Ross County both in the Championship, Butcher hopes the two clubs can soon regain their places among Scotland’s elite. Butcher, who steered Caley Jags to top-flight promotion in 2010 at the first attempt following the club’s relegation, added: “I remember Roy MacGregor – a man I respect and admire very much – saying the balance of power in the Premiership had changed to being up in the Highlands. “That balance of power is certainly not there any more with where both teams are. “I watch a lot of football at Ipswich Town, the team I started with, as I live down there. Norwich are their rivals, and people like to see the East Anglian derbies, but they want to see them in the top-flight. “It’s the same with the Highland derbies. We used to have great battles when Derek Adams was there, we had some unbelievable games against County. It was full blooded and brilliant to be a part of. Butcher was at the football museum at Hampden Park yesterday to help conduct the draw for the semi-finals of the IRN-BRU Cup, in which Ross County were drawn at home against Bohemians or East Fife.